White flowers; XII–V; dark green foliage; compact habit; height 16–20cm; spread 31–45cm. 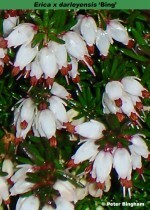 Introduced, as Erica carnea, by C. E. J. Stibbington (St Albans, Hertfordshire, England) by 1960. White flowers; XI–III; large (to 6mm long) flowers; mid-green foliage; strong but compact habit; height 35cm; spread 60cm. Deliberately raised by Peter Bingham (Gedney, Lincolnshire). Named after one of his sons, Mark (his nickname is Bing). ® E.2007:13 registered in 2007 by Peter Bingham, Gedney, Lincolnshire, UK. Flowers white, free flowering; I-V: foliage mid-green; compact habit; height 31–45cm; spread 46–60cm. An improvement on 'Silberschmelze' from which it was a sport; found by J. Wilson (Oliver & Hunter, Moniaive, Dumfries, Scotland); introduced by Oliver & Hunter in 1978. Named after a locality in Dumfriesshire, in the Moniaive area. Originally named 'Snowdrift', a name already in use in this denomination group. Flowers large, corolla and calyx white: XI-IV; foliage bright green; habit broad, upright; height 35cm; spread 40cm after 3 years. Seedling raised by Kurt Kramer in 1999. ® E.2010:06 registered on 14 June 2010 by Kurt Kramer. Edewecht, Germany. Named from a maiden name. 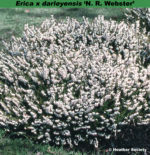 Corolla white; XI-II; foliage green; habit bushy. Flowers 2 times larger than its original variety. Sport on 'Silberschmelze' found at Vaud, Switzerland, in 1998 by Henri Bregeon. ® E.2007:10 registered 25 June 2007 by Olivier Pantin, SAPHO, Les Islettes 49250 La Menitre, France, on behalf of Aurelie, Gaelle & Pierrick Bregeon. White flowers; XII–IV; dark green foliage; height 26–30cm; spread 31–45cm. Similar to 'Silberschmelze' but blooms slightly earlier. Seedling; found by N. R. Webster at his former home, Glencairn, Elgin, Scotland, before 1954; introduced by Slieve Donard Nursery (Newcastle, County Down, Northern Ireland) by 1960. Named after Norman Webster (this is the correct name, not 'Norman R. Webster'). Note: This is difficult to distinguish from Erica x darleyensis 'Silberschmelze'. Flowers clear white; III-V, corolla 5mm long, 2.5mm across; anthers dark brown; calyx white, 2.5mm long; foliage light green; height 25cm; spread 30cm after 3 years (not pruned). Sport on 'White Spring Surprise' in winter 2007; found by Kurt Kramer; introduced autumn 2011. ® E.2014:02 registered on January 2014 by Kurt Kramer, Edewecht-Süddorf, Germany. XI–IV, silvery white; fresh green foliage; compact spreading habit; height 31–45cm; spread 46–60cm. A sport from 'Kramers Rote', found in 1996 in the nursery of Boomkwekerijen Hoekert BV (Oldebroek, Netherlands). Flowers white; XII–V; mid-green foliage sulphur coloured in summer; habit stiff bushy; height 21–25cm; spread 46–60cm. Outstanding. A chance seedling, mistakenly introduced as Erica carnea by Jack Drake (Aviemore, Inverness-shire, Scotland) by 1966. Now Classified as Erica x darleyensis f. aureifolia 'White Glow'.